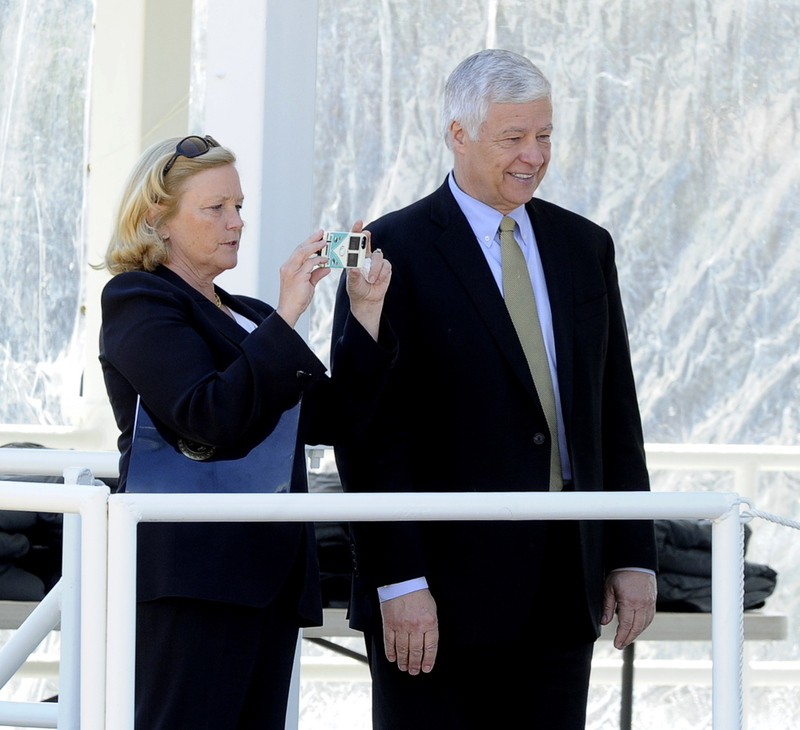 Went 2 the Bridge: "The Only Industrial Policy We Have Is A Pentagon Industrial Policy"
"The Only Industrial Policy We Have Is A Pentagon Industrial Policy"
Democrats who represent Maine in the House, Chellie Pingree and gubernatorial candidate Mike Michaud, were on hand to celebrate the launch of a $4 billion weapon of mass destruction, the first Zumwalt-class destroyer, at Bath Iron Works earlier this year. The hypocrisy of supporting military contracts that drain away funds for food, housing, health care and education for Maine's low income families is never addressed by the Democratic Party, which claims to advocate for social programs and human needs. A standing room only crowd gathered at the Winter Street Church in the shadow of General Dynamics' Bath Iron Works (BIW) shipyard for a public forum on the problem of military contracting impoverishing the many to enrich the few. Each time an opportunity arises to cut the budget for building weapons systems, elected officials claim that the looming prospect of jobs lost when contracts dry up ties their hands. Or, as panelist Margaret Craven, state senator representing District 16, put it last night: "The only industrial policy this nation has is the Pentagon's industrial policy." Organizers for the public forum see the current era of mandatory cuts to all federal program under sequestration as a time ripe for recapturing the billions wasted on building weapons. The last opportunity, the end of the Cold War era, was heralded at the time as the turning point in industry's reliance on Pentagon spending. Check out Democratic Senator George Mitchell and President Bill Clinton at a BIW labor Day Rally back on Sep. 5, 1994. What happened? As Rep. Chellie Pingree explained to me when I challenged her about conversion of BIW some years back, "You get to Congress and they say 'Do you want to put three thousand people out of work your first term in office?'" Why am I picking on Democrats? Because they talk the conversion talk, but do not walk the walk. I think their duplicity is more dangerous than the blatant war mongering of Republicans, because of all the liberals who sit home on their hands when a Democrat is in office. She went on to say, "Cuts to military spending have already drawn screeching from members of Congress...That's what we're told to do if we get to Washington – bring home the dollars. Unless there are people working on peace initiatives there are always going to be members of Congress bringing home the military pork barrel dollars instead." Much was said on the subject of tax incentive programs that benefit BIW and other corporate entities doing business in the state of Maine -- and every other state in the nation. but it is by no means the only beneficiary of this largesse....Fortune 500 to mid- size corporations have learned that they can whipsaw states against each other where they can get the best deal, the largest bite of a state or local tax rebate that they can negotiate...Wal-mart no more needs the dollars they squeezed out of Lewiston than BIW and General Dynamics need the dollars they squeezed out of the city of Bath. The defense industry plays this game very, very well. Here we are continually regaled that if Maine doesn't pony up the latest tax subsidy to BIW the work will go to another state. What is publicized as a free market economy is really a corporate subsidy economy. We (Maine) give $240 million a year in subsidies to entities that don't need the money. Panelist Mariam Pemberton of the Institute of Policy Studies (IPS) a progressive think tank in Washington DC, observed that "coming up with a plan to diversify Maine's economy could become a key issue" in upcoming gubernatorial election. She presented IPS's three point program of action for conversion. It's the shallowest drawdown in history (as a comparison, post Cold War cuts reduced the Pentagon's budget by about 1/3) and also it involves no investment in the civilian side of the budget. This is needed so defense contractors and their workers have somewhere to go and something to do...BIW is going to keep making warships as long as the only industrial policy we have is a Pentagon industrial policy. 2) Work with state legislators to create a commission to come up with plan to diversify Maine's economy. Here she observed "the unions are absolutely key to getting this done." 3) Educate legislators on availability of federal money for planning on how to diversify economies. Pemberton noted efforts in Connecticut and Maryland to plan for conversion, and expressed her view that "this is our best shot since the end of the Cold War for coming up with a peace economy." Her article "Demilitarizing the Economy: A Movement Is Underway" provides details of how the IPS three point plan is being implemented in other locations. Forum organizer Bruce Gagnon of Midcoast Citizens for Sustainable Economies pointed out that the City of Bath -- where he resides -- made an economic study in 2009 that identified that the city's tax base is overly dependent on BIW and failure to diversify the local economy “could place the City's future prosperity at risk." Pemberton cited the UMass economics study on the number of jobs generated by a $1 billion investment in various forms of economic activity showing that building weapons is the worst choice among many. (Just giving a tax rebate actually generates more jobs.) She went on to explain why military contracting is a bad job generator -- because relative to other sectors of the economy, even other manufacturing sectors, it is capital intensive and most of the jobs generated are relatively high salary jobs. Panelist Leslie Manning of Bath, a former union rep and organizer, noted that there is a lot of waste in Pentagon contracting. Her observation that there is a national movement to call for a Pentagon audit drew hearty applause from the audience. While listening to the panel I did a bit of research on whether or not Maine's two reps have put their money where their mouth is recently to cut defense spending. Here are the results. Making appropriations for the Department of Defense for the fiscal year ending September 30, 2015, and for other purposes. Rejected 165-250 Lee (D-CA) amendment to prohibit the use of funds to be used for the purposes of conducting combat operations in Iraq. Rejected 182-231 Lee (D-CA) amendment to prohibit use of funds to be obligated or expended pursuant to the Authorization for Use of Military Force Against Iraq Resolution of 2002. Rejected 157-260 Lee (D-CA) amendment to prohibit use of funds to be obligated or expended pursuant to the Authorization for Use of Military of Force after December 31, 2014. Rejected 153-260 Lee (D-CA), to prohibit use of funds for the purpose of conducting combat operations in Afghanistan after December 31, 2014. Wonder why Mike Michaud voted "yes" after years of "no" votes and telling activists that U.S. military spending is out of control -- did I mention that he got the Democratic Party nomination to run for governor?